The Scough filters out germs and pollution using military-grade technology. It also doesn't look half bad. Japan has taken the surgical mask to particularly high heights of fashion. 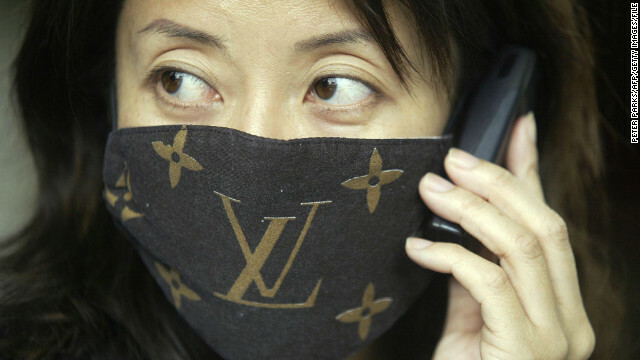 A quick search yields coughing mouths covered by animal faces, knock-off Louis Vuitton prints, Geisha lips, and more—dutifully strapped on to prevent the spread of germs. We should be so stylishly courteous here in the States. Happily, the kind germophobes at Scough have stitched up an American answer to the commuter surgical mask: Sumptuous scarves, embedded with ultra-high-grade germ filters. Scough co-founder Ari Klaristenfeld said inspiration struck on wintertime subway trips with collaborator Andrew Kessler. "He'd put a scarf over his face, like you would to stay warm, but he'd do it to protect himself from germs," Klaristenfeld says. "It wasn’t effective, but it didn't look nearly as weird as a surgeon's mask." Klaristenfeld, Kessler, and designer Alexa Nigro first experimented with inserting those masks into scarf material. But they found that while the standard paper coverings stopped gunk escaping from the wearer's mouth, they didn't do much to combat incoming particles, which is what Scough is primarily marketed to do. It's a philosophical distinction from how Japan and other mask-wearing countries approach germs. "We’re marketing it first as, 'Protect yourself and stay healthy,'" Klaristenfeld says. "And then kind of sliding in the courtesy aspect: 'Don't get other people sick.'" After consulting with medical professionals, the Scough team homed in on filters made from silver-impregnated activated carbon, a material used in masks designed to help wearers survive chemical warfare. It actively traps and kills germs as well as pollutants. The filters last up to three months, and can be slipped in and out of a pocket inside the Scough for easy Scoughwashing. Scough launches an all-new fall/winter collection today, featuring bright flannels, cashmere blends, and cotton bandanas designed for cyclists looking to combat car exhaust. Klaristenfeld is particularly excited about those. "You see people on bikes wearing normal bandanas all the time," he says. "That's not doing anything. Ours will actually protect them." Anti-germ scarves and bandanas, $29-$89 at WearAScough.com.